These are the bits we substitute with the subnet ID for each subnet. Notice that since the first three octets contain network ID bits, and the network ID is the same for every subnet, they never change. We don't even really need to look at them in binary form, though for clarity we will do so. 0. Subnet #0 has a subnet ID of 0, or 000 in binary. To find the address, we start with the network address in binary, and substitute 000 for the subnet ID bits. Well gee, those bits are already all zero! What this means is that the address for subnet #0 is the same as the address for the network as a whole: 211.77.20.0. This is always the case: subnet #0 always has the same address as the network. Converting to decimal, we get 211.77.20.32. Which is 211.77.20.64 in binary. Subnet #3 has a subnet ID of 011. As we can see the first three octets of the address are always 211.77.20. The last octet here is 01100000, which is 96 in decimal, so the whole address is 211.77.20.96. 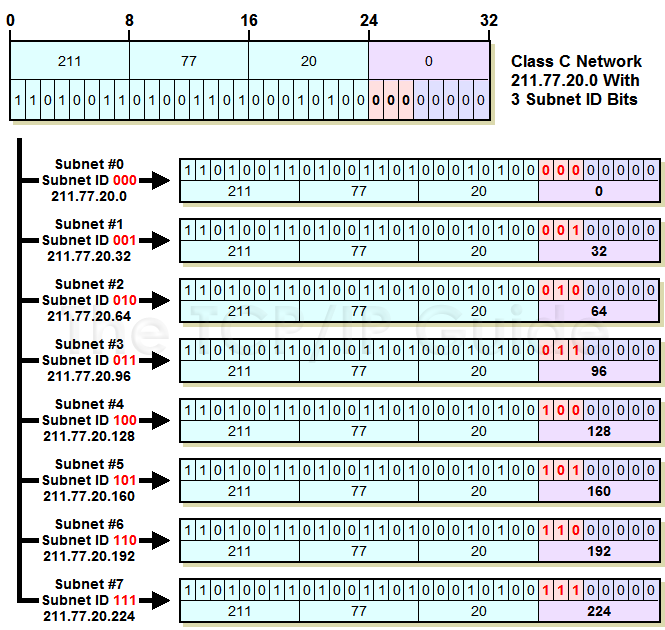 This diagram shows each of the 8 possible subnets created when we use 3 bits for the subnet ID in a Class C network. The binary subnet ID is simply substituted for the subnet bits, and the resulting 32-bit number converted to dotted decimal form. Starting to see a pattern here? Yep, the address of any subnet can be found by adding 32 to the last octet of the previous subnet. This pattern occurs for all subnetting choices; the increment depends on how many bits we are using for the subnet ID. Here, the increment is 32, which is 25; 5 is the number of host ID bits left after we took 3 subnet ID bits. Subnet #4 is 100, address is 211.77.20.128. Subnet #5 is 101, address is 211.77.20.160. Subnet #6 is 110, address is 211.77.20.192. Subnet #7 is 111, address is 211.77.20.224. Key Concept: The subnet addresses in a subnetted network are always evenly spaced numerically, with the spacing depending on the number of subnet ID bits. We only needed seven subnets in our example, #0 through #6. Subnet #7 would be a spare. Notice that the last subnet has the same last octet as the subnet mask for our network? That's because we substituted 111 for the subnet ID bits, just as we did when we calculated the subnet mask.